Symbolab allows for step by step computations online. But what if there is no Internet ? What do you do if you happen to own a Ti Nspire CX calculator? Just go to www.TiNspireApps.com and download the Step by Step app that you need. It only takes a moment to upgrade your TiNspire CX and get stepwise solutions in Math, Science or Finance. There is more than 30 apps to choose from. 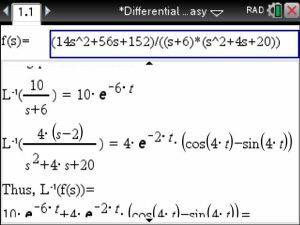 Let’s take a look two other Calculus examples that the TiNspire’s Calculus Made Easy APP and the Symbolab Calculator solve step by step. The first main topic of study in a Calculus class are limits. 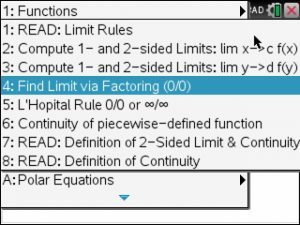 Finding limits of functions can be done in a variety of ways, one way is called factoring. 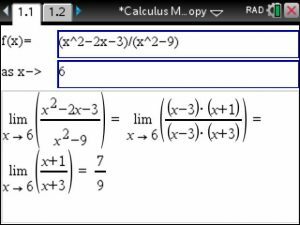 Symbolab and Calculus Made Easy will prompt you to enter the given function and both will simplify the given fraction until an x value can be plugged in. 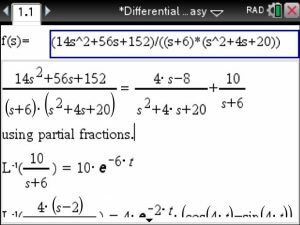 See below’s factoring example in Calculus Made Easy using option 4. Similarly, Symbolab will prompt you to enter a function to show the same steps. Lastly, let’s lastly take at look where the Symbolab Calculator and TiNspire Calculus Made Easy APP both shine. Laplace Transforms and Inverse Laplace Transforms are typical topics in engineering classes and any assistance performing those transforms is much appreciated by students. Now it is your turn, download the Tinspire’s Calculus app at https://www.tinspireapps.com/?a=CME , the Symbolab for the TiNspire CX CAS.